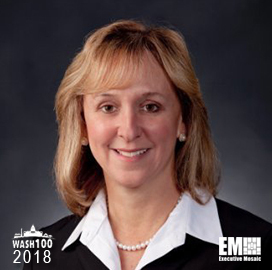 Executive Mosaic is pleased to announce Carey Smith, president of Parsons’ federal group, has been selected as an inductee into the 2018 edition of the Wash100 — Executive Mosaic’s annual selection of the most influential voices in the government contracting arena — for her role in achieving key contract awards and leading business expansion efforts. This marks her second consecutive win. That same month, Parsons began expanding its Hunstville, Ala., facility by 25,000 square feet, in a move meant to add 50 new jobs as well as integrate the company’s hardware and software platforms for customers in the intelligence, defense and infrastructure sectors. At the groundbreaking ceremony, Smith was joined by Mike Dewitz, executive vice president of engineering and technical services, and Joe Newberry, board chair of the Huntsville/Madison County Chamber. Also in October, Parsons teamed with PAE to pursue a 10-year, potentially $82 billion contract for global facility and logistical services supporting the U.S. Army. The joint venture bid on the Logistics Civil Augmentation Program V under the leadership of Scott Welker, a former deputy with the Army Sustainment Command and Joint Munitions Command at Rock Island Arsenal. In a statement, Smith noted the companies combined have years of experience providing on-the-ground and logistical support for the warfighter. In addition, Smith helped secure a major contract follow-on award last May, when it was announced Parsons will continue to plan and manage construction projects for the National Nuclear Security Administration under a five-year task order. The deal encompasses everything from lifecycle support services, such as planning, budgeting, procurement and design, to commissioning and closeout. Ultimately, the construction program is valued at more than $10 billion over the next decade. Before working at Parsons, Smith served as president of Honeywell‘s defense and space division, a business unit ranked number 15 among worldwide defense companies with an annual revenue of $4.7 billion in 2015. Smith was re-elected in December as secretary of the Professional Services Council’s board of directors. She has been named one of the Top 100 Diverse Corporate Leaders in STEM in 2014 and one of the Top 100 Women in STEM in 2012 and 2017. Executive Mosaic congratulates Carey Smith and the Parsons Federal Group for receiving this award.